U.S. markets opened mixed Monday with corporate earnings in focus. The three top stocks to watch today are Global Payments Inc. (NYSE: GPN), Lululemon Athletica Inc. (Nasdaq: LULU), and Ariad Pharmaceuticals Inc. (Nasdaq: ARIA). Geopolitical risks could have the biggest impact on today's stocks to watch. Markets were jolted by comments from British Prime Minister Theresa May. On Sunday, May said the UK would make a definitive break with the European Union despite talk of a "soft Brexit." The pound slumped to its lowest level against the dollar since October, falling by more than 1% to $1.216 as European markets opened. Shares of Global Payments Inc. surged 6.33% in early trading after beating fiscal Q2 2017 earnings and revenue estimates. The company raised its FY2017 guidance too. GPN's board also approved a $300 million increase to the company's existing share repurchase program. Based in Atlanta, Ga., Global Payments provides solutions credit cards, debit cards, electronic payments, and check-related services worldwide. With more than 8,500 employees, Global Payments merchants and partners are dotted across 29 countries. Adjusted earnings per share (EPS) grew 17% to $0.80 in Q2 2017 compared to $518.3 million in the same quarter a year earlier. Revenue came in at $941.8 million, up from $722.4 million year over year. The company also raised its expectations for expense synergies from its April 2016 completed merger with Heartland Payments Systems to $135 million. That's up $10 million from its previous target. At $79.19, GON shares are up 31.51% over the last year. Shares of athletic apparel maker Lululemon Athletica slipped 1.36% at $67.30 in early trading despite upgrading its guidance for Q4. The company said today that net revenue for Q4 is expected between $775 million and $785 million. That's up from previous revenue guidance for between $765 million and $785 million. 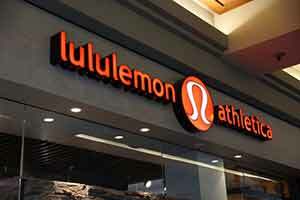 Lululemon also narrowed its earnings guidance to a range of $0.99 to $1.01 per share from $0.96 to $1.01 per share. Best known for its yoga apparel, Lululemon cited strong holiday sales at brick-and-mortar stores and digital channels for the upbeat guidance. This week, Lululemon will present at the ICR Conference in Orlando. Its full earnings report will be released at the end of March. At $67.45, LULU shares are up 25.12% over the last year. The Ariad Pharmaceutics Inc. stock price surged 73.22% to $23.79 after Japanese pharmaceutical company Takeda Pharmaceutics Co. Ltd. (OTCMKTS ADR: TKPYY) announced it is buying the Cambridge, Mass.-based company in a $5.2 billion deal. Takeda is paying $24 per share in cash for Ariad. That represents a more than 75% premium to Ariad's closing price on Friday. The deal is expected to close in late February. Ariad is an oncology company that engages in the discovery, development, and commercialization of drugs for cancer patients in the United States and internationally. Takeda CEO Christophe Weber said opportunities to acquire such high-quality, complementary targeted therapies do not come often. He added that Takeda is excited about the potential for this transaction for patients and shareholders.